A kind-hearted robot that vanquishes foes with his Buster Weapon! Originally created by Dr.Light to help with chores around the research lab. After the evil Dr. Wily's visit, Mega's sense of justice was burning hot, and he begged Dr. Light to upgrade him and give him the ability to fight. 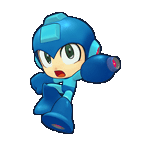 Mega Man possesses a gentle personality and is kind to everyone he meets. Complete MegaMan Compendium Coming Soon!